With a large number of tax agents across Sydney, choosing the right professional for your needs can seem daunting. However, at Antony Syndicate you can be assured of our expert tax collaboration, from tax advice right through to the lodging of your income, FBT and GST returns. We have built our reputation on providing superior tax services across all sectors of Sydney’s investment, real estate, business and high-net-worth community. Including assisting small and medium businesses, such as sole traders, partnerships, franchisees and their employees. We guide our clients through the ‘minefield’ of taxation and related business, trust and corporate matters. Do you really know what you can and can’t claim in a tax return or your business? Such can make all the difference to your overall financial standing. Our taxation specialists have an in-depth knowledge in all areas of deductible expenses and assets so as to ensure that your tax return is maximised, or your tax bill is minimised. We go through every aspect of your business or income activity and make sure you can claim everything you are entitled to. The best possible tax return can make all the difference to sustaining a viable business for the long term let us help you achieve this today. Are your businesses or investments set up to legally minimise your tax liabilities both now and most importantly in the future? Do you find keeping track of your tax responsibilities complicated and labour intensive? We assist companies and individuals with structuring their businesses in a way that protects them from the ‘Nanny State’. We prevent the loss of your wealth by making sure that you and any tax auditors are not incorrectly applying taxation law. We will assist you in structuring your financials in an easy to understand, and affordable, manner. Help your business and investments to evolve into a sustainable and profitable enterprise with our strategic tax advisors. The right tax agent can literally save you thousands (even millions) of dollars and you can be assured that our services will be completed in a timely and thorough manner with the utmost attention to detail. We build long-term taxation relationships with our clients and we wish to share our professionalism and expertise to benefit your business, your family and you. Whatever individual financial circumstances you face as part of your Sydney business or investment dealings, we have a unique and tailored solution for you. From asset protection strategies, self-managed super funds, family trusts or just setting up a simple taxation structure to keep your wealth where it belongs, Antony Syndicate’s registered tax agents have you covered. 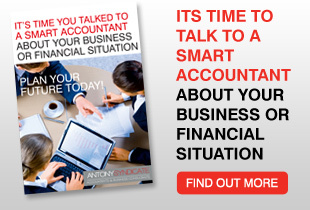 Now is the time to call Antony Syndicate on 02 9648 6880 for taxation services tailored to your unique needs. Our fees are both affordable and realistic.